I needed something sweet....I use that term "needed" very loosely, but the struggle was real in the moment. I didn't want to invest a lot of time, but I wanted something homemade. 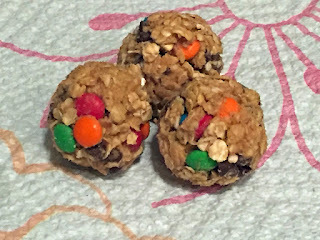 These little monster bites are so easy to put together and they really are tasty without a ton of different ingredients. I recommend chilling for an hour or so before eating, but they are really delicious straight from the spoon as well. Whether they chill are not often depends on my craving. I like to half the recipe (half makes about 10). So, for my future self when I'm craving something quick, easy, and tasty and forget everything I ever knew in my pursuit of hunger quenching desserts-self, make these again. Mix, Roll, Chill for about an hour (until the peanut butter is more firm).